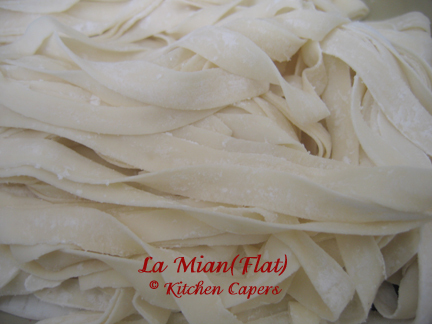 I use my new toy(the Noodle Maker aka Pasta machine) to make this very flat, very thin La Mian. It turn out that the noodles look more like Kway Teow after its cooked. But does not tear as easy as Kway Teow. it retain all the chewy texture of what La Mian was to be. But it was White like Kway Teow. Note that the machine I had has only 7 marks of thickness adjustment. 1 to 7. 1 is the thinness and 7 is the thickness. Depending on the brand of machine you had, please adjust it according. 1. mix all the ingredients together to form a smooth dough. 2. Cut into 5 smaller dough so that it can slide thru the machine. 3. Turn the thickness mark to 5. 4. Take one piece of dough to slide thru the flat press. 5. Do this at least 4 times till the dough becomes very smooth. 6. Dust flour on both sides of the flatten dough. 7. Run it thru the 2nd press (the one that cuts it like kway teow size). 8. Now turn the thickness mark to 4. 9. Run thru the cut noodles thru it. 10. Out comes the extra flat noodles. 11. Leave it to rest for 30 mins. 12. Pick up the noodles and toss using both hands in a see-saw motion before blanching in hot water. 13. Sieve the hot noodles into a bowl of tap water. Cook as per your recipe. So I cooked Bak Chor mee with it! 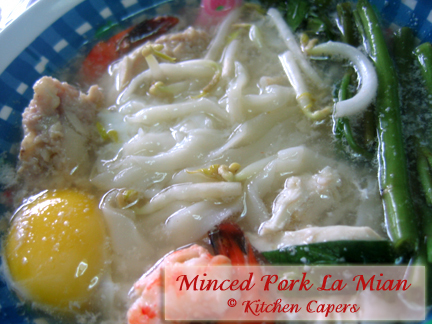 may i know this La Mien are same like those Minced Pork Mushroom Noodles mah? no. 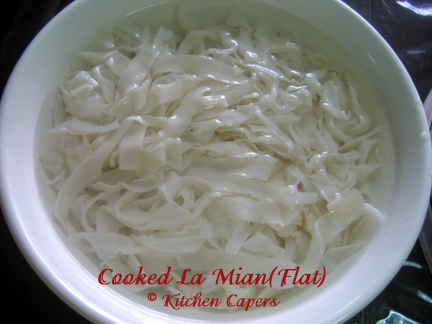 but with la mian, you can cook with any recipe you like. Doesn't necessarily have to stick to one recipe. as you know, Bak Chor mee is often eaten with the dried yellow noodles or the yellow noodles. its something different for a change. my hubby loves Bak Chor mee..now with la mian, he loved it even more. Oh i see... Your Bak Chor mee really looks Delicious!! Btw, Gina, do u know how to make Yellow Noodles( Mee Kia) or Mee Pok which usually used in Bak Chor mushroom Noodles mah? for that, I think sinner(sin heng) has already shared the recipe. Its home made wanton noodles. the difference is the Mee Pok is a dried noodle and probably has Alkaline water added to it to have that smell of "Kee". 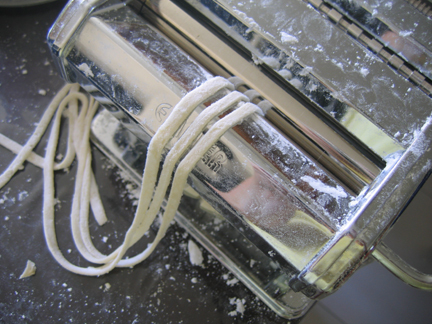 the base of yellow noodles are just flour, egg, water, salt and Alkaline water.